Wow! What did I start! Truth is, knowing your tastes, if you enjoy Apocalypse Now, you may prefer the longer version. But it's much longer and you've a better chance of enjoying the original cut. I'm bearing in mind you haven't seen many war films. And hey, it's the one everyone else was happy with for years! Normally I agree with Jimmy, director's cut should mostly be preferred. Usually this ranges from adding back blood and cuts which was censored out all the way to a full re-edit after the film may have been butchered by the studio (Brazil; although in Europe we apparently always saw the real thing...(?)). There are obvioiusly be exception, like the Star Wars stuff, or Blade Runner. Yes, Blade Runner, because here the released "Director's Cut" was not made by Scott, actually, but what the studio thought what he wanted. Hence the name "Final Cut" for when he actually got to do what he wanted; despite the reshoots he merely tweaked the original, something Lucas should take an example in. 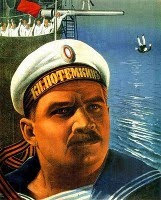 Based on the historical events the movie tells the story of a riot at the battleship Potemkin. What started as a protest strike when the crew was given rotten meat for dinner ended in a riot. The sailors raised the red flag and tried to ignite the revolution in their home port Odessa. This is one of those cheap freebie movies I got in a 40 movie boxset for subscribing to the Total Movie Magazine years ago. But is one I never got around to watching. So going into it I wasn't expecting much quality wise. And there was definitely problems with the quality... there was plenty of dust and scratches on the film... there was also plenty of shaky images... but to be honest I expected worse. I mean after all... this movie is over 80 years old. This is some sort of redone film as it is a silent film... but there is a guy speaking Russian over the opening. Unfortunately I had a hard time with the subtitles on this release... as some of it was cut off at the bottom of the screen so no idea what was being said in some parts... especially towards the beginning. Plus what subtitles were shown was show pretty quickly making it hard for a slow reader like me to watch it I had to keep pausing and rewinding to see what was being said at times. I did like that this film is based in fact. Or at least that is how it seems. I never been a good history student.... though the name of the ship did always seem familiar to me. But it is definitely not depicting a good time in history. The story itself is powerful enough to keep your interest. I just wish the quality was a little better... and some of the subtitles a little slower. I would have probably been able to enjoy this story a little more then I did. I picked this one because it was a review request at another forum. And I had it in my collection for so many years I just wanted it off my unwatched list. I still haven't decided if I will watch a TV Show between the movies or not. I guess we will just see what I pick to watch next. Don't forget it was done after the Russian Revolution and propaganda play a large part on this one (considering there were always fight in some part of the country). Never seen it, I know it's real story since Eastern European history was part of my university corpus (but the bread crisis played a most important part in the Russian Revolution than this) but I'm far of being an expert. Our German members (who lived in East Germany) are probably the best for demixing the propaganda from the truth. Blade Runner, because here the released "Director's Cut" was not made by Scott, actually, but what the studio thought what he wanted. Hence the name "Final Cut" for when he actually got to do what he wanted; despite the reshoots he merely tweaked the original, something Lucas should take an example in. I think he did do the DC himself, he just didn't have the time to do it properly. That was one messed up release until the FC! Good for you for trying it, Pete. Damn shame it was clearly a poor release because it's one of the most important films ever made, from the perspective of editing at least. Why were the other forum pushing you to see it now, out of interest? I think mainly because he was planning on watching it soon... and wanted my opinion first. But that is ok... it is about military (why I have it in my list)... and been in my unwatched pile for years... was starting to get sick seeing it there! Did you recognize the stair scene, which Brian De Palma copied so famously in The Untouchables. I have the film in a remastered version on Blu-ray, but haven't watched it yet. I knew it reminded me of something... but been so many years since I seen it... it didn't come to mind. 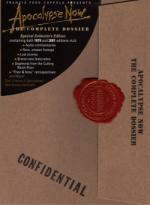 Two-disc Special Collector's Edition includes over two hours of bonus materials from filmmaker Francis Coppola and his American Zoetrope vault. APOCALYPSE NOW (1979) 153 MIN. Francis Ford Coppola's stunning vision of man's heart of darkness revealed through the madness of the Vietnam War. Lieutenant Willard receives orders to seek out a renegade military outpost led by the mysterious Colonel Kurtz. Willard's mission: "Terminate with extreme prejudice." One of the most powerful films of all time, Apocalypse Now was nominated for eight Academy Awards and won two for Best Sound and Best Cinematography. APOCALYPSE NOW REDUX (2001) 202 MIN. The definitive version of Francis Ford Coppola's stunning vision of the heart of darkness in all of us, re-edited and remastered with 49 minutes of additional footage. Nominated for 8 Academy Awards®, this classic and compelling Vietnam War epic stars Martin Sheen as Army Lieutenant Willard, who is sent on a dangerous and mesmerizing odyssey into Cambodia to assassinate a renegade American Colonel named Kurtz (Marlon Brando), who has succumbed to the horrors of war and barricaded himself in a remote outpost. What with my first time ever seeing this movie... and with War not being one of my genres of choice I decided to go with the original theatrical cut for my first viewing. I just couldn't see sitting through almost three and a half hours at this point. right around two and a half hours is enough for the first sitting. I figured that I will go for the director's cut on the next viewing. I have to say... this movie had me glued to the set from the very beginning. What has always been a sign of a great movie to me is if you get into a movie so intensely that it seems to be over within mere minutes of starting it. It seemed like I had just started the movie and it was time to switch over to disc two. And then before I knew it the movie was going off. It really is an excellent film. While I preferred the first half of the movie over the second half... the entire movie is just outstanding. Of course coming form me it isn't saying much... but this is definitely one of the best war movies I ever seen. The next time I am going to have to be sure to watch Apocalypse Now Redux. I'm pleased you responded to it so well, Pete, especially following the hype we gave it! Like I said, I have a feeling you'll enjoy Redux just as much when you get around to it, but for now you did the right thing. Now that you've cut your teeth on this one, you might want to try The Deer Hunter. Also an excellent Viet Nam war movie! I just finished watching this myself; also the theatrical cut. It's been longer than I had thought since I saw the Redux cut, four, not two years, but from what I remember I'll say this version is, obviously much tighter and to the point. The amount of pure madness that comes with war is already enough. The extended cut has more of that and I remember especially the scene with the French people to be rather tedious and overly slow, also the finale with Kurtz, already quite a change of pace as it is, is drawn out even longer. I might see Redux again, but theatrical is clearly my preferred cut. I watched the Full Disclosure Blu-ray, which had excellent video and awesome sound. One major reason why I saw this today was, that I am very much looking forward to see Hearts of Darkness, probably right away tomorrow. Thanks for the suggestion Hal. I won't be able to watch it this weekend as I don't have that one yet... but will keep my eyes open for it. The Deer Hunter is an excellent companion piece. There's very little war stuff in it, because it's about the men, their lives and how war changes them. You could say, The Deer Hunter is about the heartbreaking emotional reality of war, Apocalypse Now embodies the psychological madness and horror, while Platoon (the only one directed by someone who was there) depicts the physical logistics of what happened to the troops cut off from their lives, fighting for a cause they don't understand and re-writing the rules. If you add the politics of The Quiet American, these four films tell you all you need to know. Of course there are many more, but if you had to narrow it down, these are where it's at.